Describe the process of tsunami formation and development. Explain the effects of tsunamis and the hazards they pose to coastal regions. Analyze what geographic regions are at risk for tsunamis. Analyze the linkages between tsunamis and other natural hazards. Describe what nations, communities, and individuals can do to minimize the tsunami hazard. Most people never thought much about tsunamis until the cataclysmic event that occurred on December 26, 2004 in Indonesia. Tsunami actually is a Japanese term that means "harbor wave". There are four major ways tsunamis form: underwater earthquakes, volcanic eruptions, landslides, or extraterrestrial impacts such as asteroids. These four seismic events will be looked at in greater detail in a minute. The formation of a tsunami by these catastrophic events is called tsunami initiation. Now once a tsunami is generated, it will travel outward in a circular radius from the tsunami epicenter at speeds of 500 mph! But the height of each wave crest in the deep ocean is only 2-3 feet, thus large ships never feel tsunamis in the deep ocean. It's important to stop here and briefly discuss the physics of energy traveling through water. First, a wave of water is called a wave - that was easy! Next, the distance between two wave peaks or heights is called a wavelength. The time it takes one wavelength (distance between two wave peaks) to pass a given position is called the frequency. Thus, waves with long wavelengths have low frequencies because it takes a long time for the wave to cross a given point. Waves that have short wavelengths have high frequencies. Have you ever watched an object floating in water as a wave passes by it? Let's say it’s a stick in the ocean. Now when that wave passes by, the stick does not travel with the wave; rather the stick bops up and down but stays relatively in the same place. That is because the water does not travel with the wave's energy; rather the energy passes through the water causing the water to travel in a circle (which appears as an up, slightly forward, down, and backward motion). The depth of the circular size of motion generated by waves is half the distance from each wave crest. Thus if the distance from one wave crest to the next wave crest is one mile, the depth of the water's circular motion is half a mile. This is important because tsunamis have very long wavelengths, thus their depths reach the ocean floor. This file is licensed under the Creative Commons Attribution-Share Alike 3.0 Unported license. Click on the image to view the source. It was noted above that out in the deep ocean, the height of a tsunami is only a few feet high with very long wavelengths. This is because in the deep water, the amplitude of the waves is very small and the wavelengths quite large for anyone on a boat to notice. But as the tsunami approaches the shoreline, it begins to slow down and grow taller because the friction between the oscillating tsunami waves comes into more contact with the rising elevation of the sea floor. This friction causes the wave's amplitude to grow, the wavelength shorten (distance between each successive tsunami wave), and the frequency becomes shorter causing the energy of the tsunami to make the wave grow taller. The height of a tsunami is called the run-up. Thus when a tsunami reaches shore, it may have slowed to 30-40 mph, but dramatically higher. The size of the run-up is determined by the distance between the tsunami epicenter and the shoreline, the energy released by the tsunami initiation, and the steepness of the continental slope. Tsunamis are also not a large, single wave coming ashore, rather they are a series of powerful, rippling waves called a tsunami train. As the waves approach shore, the shoreline oftentimes disappears as the water is pulled back into the ocean to build up the waves. Many people find this strange event enticing and go onto the beach to see the fish flapping on the newly bare ground. But this is a false sense of security and within minutes the series of waves comes crashing ashore. Often times there can be up to ten individual tsunami waves and the most powerful ones may be the second or third wave. So if you see the water along the coastline disappear, you need to quickly gather your family and friends and head to higher ground. Most tsunamis occur because of powerful, subduction zone such as the Ring of Fire. Thus, most tsunamis are generated by reverse fault or thrust fault earthquakes along subduction zones because of the amount of water displaced by these events. But not all reverse fault earthquakes can initiate tsunamis. The minimum magnitude of an earthquake needed to create a tsunami is a 7.5; the Asian tsunami of 2004 was generated by a M 9.1 thrust fault along an oceanic-to-oceanic subduction zone. Strike-slip faults along transform boundaries do not generate tsunamis because their parallel movement does not displace enough water. The potential for a tsunami striking the United States is very high for a variety of reasons. One is because of the oceanic-to-continental subduction zone in the northwestern states of Washington, Oregon, and northern California. Recall from previous modules that this subduction zone not only generates earthquakes, but has produced the major volcanoes of the region such as Mount St. Helens, Mt. Rainer, and Mt. Shasta. Research show that ever few hundred years the region experiences a M 9.0 earthquake generating a major tsunami that would reach coastal cities within 20 minutes. Obviously there would be no time to evacuate the people in time. Less common, but still a force to consider are large, violent, composite volcanoes. There are a couple of ways a volcano can generate a tsunami. Sometimes just the energy released by the volcano along with the pyroclastic flow can initiate a tsunami. Other times, a violent eruption can cause a portion of a volcano's slope to slide off into the ocean. The most dangerous way would be if a volcano explodes or collapses to generate a caldera in the ocean. There are some real-world examples of these occurring. In 1883 on the volcanic island of Krakatau (image on the right), a violent eruption occurred producing a tsunami that killed 35,000 people and destroyed two-thirds of the island. It is believed a massive pyroclastic flow slammed into the ocean producing a massive tsunami. Ultimately the eruption was so violent that the island collapsed to produce a massive caldera of the former island. A concern today is the volcanic islands off western Africa called the Canary Islands. Scientists are concerned with an unstable slope on the western side of one of the volcanic islands. Their concern is that a major eruption could cause a portion of the slope to slide off into the Atlantic Ocean, generating a massive tsunami. Within 9 hours - traveling at 500 mph - this tsunami would reach the eastern United States with a run-up of nearly 150 feet! Last, but not least, is the major island of Hawaii - Mauna Loa. Scientific studies of the former volcanic islands that use to be over this hot spot show that shield volcanoes tend to grow fastest just before they move off the hot spot. Mauna Loa is the most active volcano in the world and is about to move off the hot spot. In fact, a new volcanic island is beginning to form underwater just east of the main island. Studies are showing that the increased activity and lava flows can destabilize portions of the slopes as more weight is added. Field works has discovered that Mauna Loa has had over 60 giant debris avalanches that slide into the Pacific Ocean. These slides tend to be 10-20 miles long and could ultimately generate a tsunami 900 feet high! Large scale landslides can also displace large amounts of water to generate massive tsunamis. But often times, it’s a volcanic eruption or earthquake that generates the landslide, which creates a tsunami. One concern for the United States is an underwater landslide - called a submarine landslide - off the eastern coast of the continental shelf can displace enough water to generate a 20 foot tsunami and reach the nation within 20 minutes. 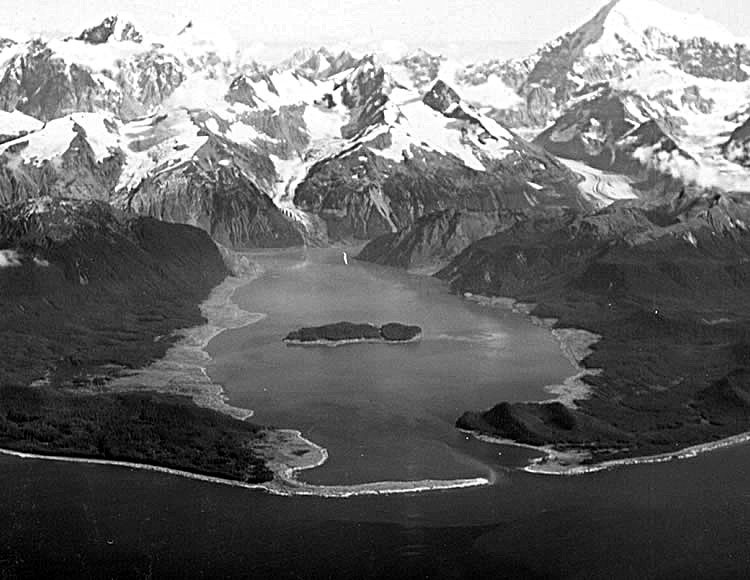 The largest landslide ever recorded in human history happened in Lituya Bay, Alaska. 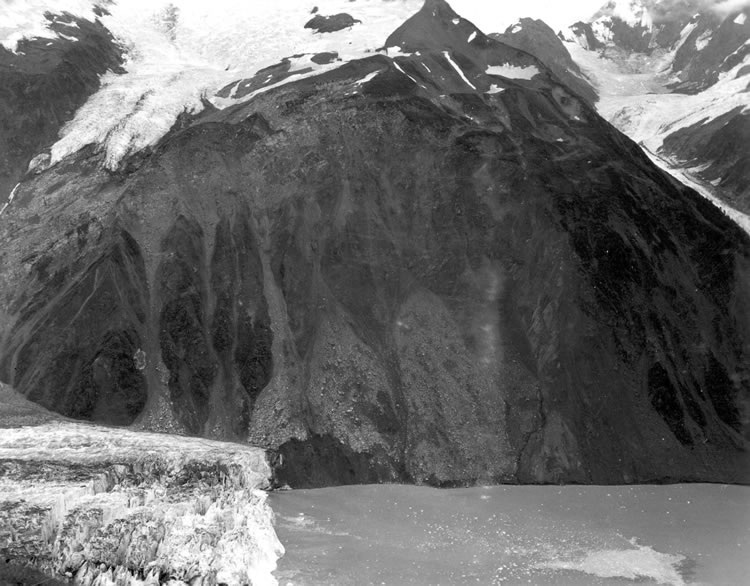 A magnitude 7.0 earthquake along the Denali Fault generated a massive rock fall into the bay, which produced a 1,700 foot tsunami! But the bay contained most of the energy and thus a major catastrophe was averted. But the concern is another such event occurring in Glacier Bay, Alaska which is a major tourist attraction for cruise lines. The rarest, but most lethal tsunami would be generated by an asteroid or comet impact. If an asteroid were to make it through the earth's atmosphere, there is a 70 percent chance it would land in the ocean. For example, an asteroid striking the Atlantic Ocean could produce a tsunami that would cover over half of the nation. All coastal cities around the world would also be destroyed. And with 90 percent of all humans living near a large body of water, well you see the impact! As most of you are aware, the last asteroid impact in the ocean occurred 65 million years ago and produced a tsunami half a mile high. There are a variety of coastal vulnerabilities caused by tsunamis. As noted in previous modules, there are two types of effects of tsunamis (and all disasters). The primary effects are pretty straight forward. Areas at most risk of tsunamis are highly populated coastal regions such as major cities. And if the tsunami occurs during high tide, the fingers of destruction will reach farther inland. Most of the deaths from the Asian tsunami of 2004 were from flooding and the actual debris within the water. Other primary effects include coastal erosion and the destruction of ecosystems. The following are aerial photographs of tsunamis from National Geographic. The secondary effects of tsunamis are less obvious. These include contaminated water sources, disease outbreaks, chemical pollution, homelessness, and economic loss. Sometimes the secondary effects are worse than the primary effects because all the new attention occurs with the primary effects, but very little attention is on the region after a few months. The Great East Japan Earthquake of 2011 was the most documented natural disaster in human history. Click here to view some amazing aerial imagery of this catastrophic event. People and ecosystems are quite resilient to natural disasters, but a lot must be done to prevent massive death and destruction to begin with. After a deadly tsunami in Hawaii in the 1950s, the United States developed the Pacific Tsunami Warning Center. If a M 7.5 earthquake occurs somewhere in the Ring of Fire, a tsunami watch is released by NOAA indicating that a seismic event just occurred that could have generated a tsunami. Out in the Pacific Ocean, a system of instruments on the ocean floor and buoys monitor the Pacific Ocean for tsunamis. If the system detects a tsunami, a signal is sent to satellites, which is then sent to coastal areas and a tsunami warning is announced. Another mitigation measure is tsunami run-up maps. A tsunami run-up map indicates how far a tsunami will travel inland based on the continental shelf and strength of the tsunami. By understanding where and how far a tsunami will travel inland, government agencies can determine proper zoning and building codes. Before the Asian tsunami of 2004, the United States had tsunami run-up maps of Indonesia but were considered classified. Indonesia, being a poorer nation, did not have run-up maps for their own nation. After the catastrophic event, the U.S. military saw how destabilizing this was to the nation and decided to release this information from the run-up maps to the region. The video on the left is about the magnitude 9.1 earthquake and tsunami near Indonesia, called the Sumatra-Andaman Earthquake, in the Indian Ocean on December 26, 2004 that killed over 200,000 people. The earthquake occurred along a oceanic-to-oceanic subduction zone and created a fault scarp 60 feet high for nearly 800 miles. The video on the right is about the Great East Japan Earthquake of 2011. There a magnitude 9.0 earthquake along an oceanic-to-oceanic subduction zone generated a powerful tsunami that killed the most documented natural disaster event in human history.